UPDATED: Sun., March 26, 2017, 3:57 p.m. The Spokane Symphony, reviewed Saturday at the Martin Woldson Theater at the Fox. Like what you heard at the symphony, or want to know what you missed? Reviewer Larry Lapidus has compiled a list of his recommended recordings of this week’s concert program. The first thing one learns in attending concerts of classical music is never to applaud between movements. Doing so, we are told, shows disrespect for the composer’s intentions and the performers’ interpretation. In Saturday night’s concert by the Spokane Symphony at the Martin Woldson Theater at the Fox, that hallowed rule was enthusiastically, even raucously, broken. The evening began seriously, however, with an announcement that the weekend’s concerts were dedicated to the memory of Dr. Elizabeth Welty, who died in September, and was, even as a centenarian, a high-voltage advocate and inexhaustible supporter of the arts in Spokane, and especially of the Spokane Symphony. Furthermore, the first piece on the program, initially programmed to be the lively, folk-infused “Kamarinskaya” (1848) by Mikhail Glinka, was changed to the Adagio in G minor for Organ and Strings, purportedly by Venetian composer Tomaso Albinoni (1671-1751), but more likely the work of Remo Giazotto, who claimed to be its “arranger.” It is an attractive, elegiac work that was performed with appropriately late-romantic intensity in memory of Kendall Feeney, one of the most prominent figures in Spokane’s cultural life, who died March 5. Taking the keyboard part, which otherwise would have been assigned to Feeney herself, was the estimable John Bodinger, who contributed so much to the recent Northwest Bach Festival. 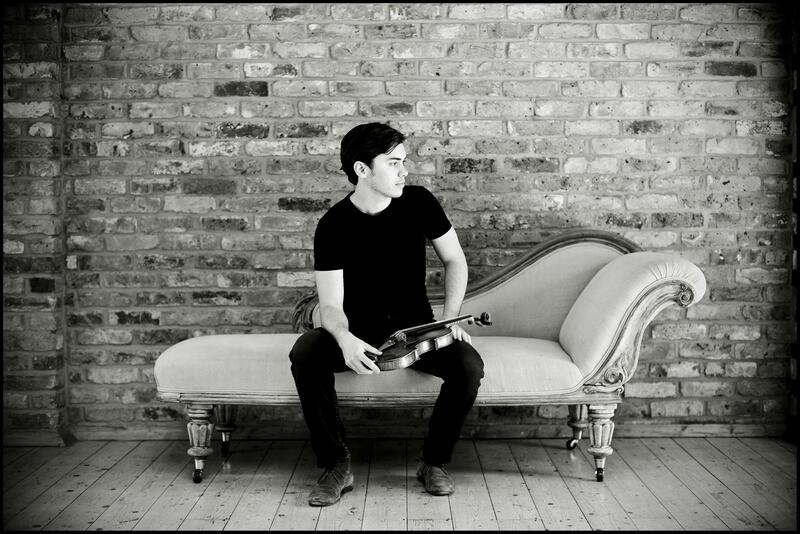 The temperature in the room began to rise with the appearance onstage of the evening’s soloist, Benjamin Beilman, carrying his new fiddle, the “Engleman” Stradivarius of 1709, lent for his exclusive use as an award from the Nippon Foundation. Anyone in the audience prepared for yet another flashy run-through of a familiar war-horse by the latest young virtuoso was sadly mistaken. From the first improvisatory bars of his entry, Beilman made plain that he was taking a fresh, imaginative look at Pyotr Ilyich Tchaikovsky’s (1840-1893) Violin Concerto in D major Op. 35 (1878). One sought in vain for echoes of earlier great interpreters of the work. Heifetz? No. Oistrakh? Uh-uh. Milstein? Nope! This was Beilman, determined to find the heart of Tchaikovsky’s beloved concerto and set it beating again. With the unfailingly sensitive and responsive support of Eckert Preu and the Spokane Symphony, Beilman restored passages traditionally cut, removed alterations intended to sweeten or intensify the virtuoso character of the solo part, and, perhaps most important, refused trying to make the piece into what it is not: a classically balanced composition in the mold cast by Mozart, Beethoven and Mendelssohn. Rather than hold to a relentlessly regular tempo, Beilman and Preu considered the character of each segment of the piece, and adopted the tempo which allowed it to emerge most completely and naturally. In this way, Tchaikovsky’s repeated sequences, so often viewed as defects, were shown as but one of the composer’s many devices for building tension, only to have it released in one of his hallmark climaxes. This approach was so brilliantly executed, and did so much to enhance the audience’s delight in the music of the first movement, that they found it impossible to observe the sacrosanct rule of silence when it came to a close. They rose to their feet to express their gratitude with foot-stamping, lung-stretching enthusiasm, which reappeared at the concerto’s close. Beilman acknowledged the acclaim with an encore: the Gavotte en rondeau from J.S. Bach’s Partita No. 3 for solo violin. One could argue that the interpretation was outside the bounds of baroque style, but, in the face of such gorgeous playing, who would quibble? The final work on the program, Dmitri Shostakovich’s (1906-1975) Symphony No. 9 in E-flat major Op. 70 (1945), is frequently described as light-hearted and charming. Likewise, Maurice Ravel’s “La Valse,” which appeared at the orchestra’s last concert, is often taken to be touchingly nostalgic. In both cases, Eckart Preu’s keenly observant interpretations clearly reveal the worm in the apple. Just as we saw Ravel’s waltz tune turn sour, so Shostakovich’s chipper military march in the first movement becomes too insistently cheerful, too repetitive, too mechanical. We are soon conscious of listening to a parody of a sort of shallow patriotism that could only survive by ignoring the truth. Shostakovich points us to the sinister reality of an authoritarian state that saw many of his friends and colleagues exiled, imprisoned, or murdered. The ghosts of Tchaikovsky and of other Russian composers of the 19th century haunt the Shostakovich Ninth, appearing in the glints of color, lyricism and beauty that glimmer briefly in the music, only to be cut short or blighted by an outburst of militaristic brass or unexpected silence. The symphony inherits the mastery of writing for woodwinds we heard in Tchaikovsky’s concerto, most notably in Lynn Feller-Marshall’s riveting solos in the fourth movement, in which her bassoon is made to express the anguish, perhaps of the composer, perhaps of the Soviet people, before retreating into a fictional world of inane gaiety. Likewise, Alaina Bercilla’s playing of the preposterously difficult piccolo part provided essential underlining to Shostakovich’s ironic intent. Just how listening to someone blowing into a tube or scraping a string can allow us to see deeply into the human heart remains a mystery. That it does, however, cannot be denied. Published: March 26, 2017, 3:47 p.m. Updated: March 26, 2017, 3:57 p.m.